The poisonous rhizome of this low perennial gets its name from its bright red-orange sap. The showy flowers have 8-12 bright white petals 1-2 inches long encircling bright yellow pollen sacs. The usually solitary leaf, is 4-8 inches across and deeply cleft into numerous segments. 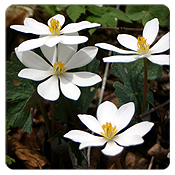 A native of the eastern US, Bloodroot is frequently found in open mixed deciduous forests. March-April.